Per his military service record (regimental no. 4752), William Collyer was born at Wongarbon, N.S.W. He gave his age as 19 years and 3 months, his marital status as single, and his occupation as butcher. (He was the son of Thomas William Collyer and Flora Collyer). His description on his medical was height 5 feet 8 ½ inches tall, weight 10 stone 10 lbs., with a fair complexion, blue eyes, and fair hair. His religious denomination was Church of England. He completed his certificate of medical examination on the 17th October 1915 at Wellington (while the Coo-ees were at Wellington). However he was not attested until 24th October 1915 by Captain Nicholas at Orange. A note at the top of his Attestation Paper reads ‘Presented himself 24/10/1915 with form signed by Metcalfe [the doctor at Wellington]. Sworn in 24/10/15’. His Application to Enlist in the Australian Imperial Force form, addressed to the Recruiting Officer at Wellington, was signed by both his father Thomas Collyer and stepmother Ellen Collyer, so perhaps he had travelled back to Wongarbon to get the consent of his parents, before he caught up with the Coo-ees at Orange. He claimed that he had no previous military service. ‘William Colyer’ [sic] was listed in The Leader as one of the men who were recruited at Orange to join the Coo-ees. ‘W. Collyer’ was listed as one of the ‘Wongarbon boys’ with the Coo-ees in The Dubbo Liberal and Macquarie Advocate. After completing the remainder of the march he went to Liverpool Camp as reinforcement for the 13th Battalion. The Wellington Times reported that Privates W. Collyer and H. Saunders were presented with wristlet watches by the residents of Wongarbon at a farewell social while they were home on final leave on 3rd March 1916. On his embarkation roll his address at time of enrolment was Wongarbon, N.S.W., and his next of kin is listed as his father, T. Collyer, Wongarbon, N.S.W. On 8th March 1916 Private Collyer, along with many of the other Coo-ees, departed Sydney on the HMAT A15 Star of England. He arrived in Egypt on 11th April 1916. On 16th April 1916 he transferred to the 4th Division Artillery at Tel-el-Kebir, and was taken on strength of the 10th Field Artillery Brigade. He was also mustered as a Driver. On 25th May 1916 he was transferred to the Artillery Training Depot at Tel-el-Kebir. On 28th May 1916 Gunner Collyer left Alexandria on the HMT Corsican, bound for England. He disembarked at Plymouth on 12th June 1916, for further training. On 30th July 1916 Gunner Collyer departed England bound for France. On 9th August 1916 Gunner Collyer was taken on strength of the 4th Division Ammunition Column in France, while it was training in the vicinity of the village of Acquin, 9 miles from St. Omer. On 14th October 1916 his rank was changed to Driver. On 7th March 1917 Driver Collyer’s rank was changed back to Gunner. On 29th November 1917 Gunner Collyer was granted leave to England. On 13th December 1917 whilst on leave in England, he was admitted to the 1st Australian Dermatological Hospital at Bulford, England, sick. He was discharged from Hospital on 1st April 1918. On 2nd April 1918 he marched into to No. 1 Command Depot at Sutton Veny in England. On 24th May 1918 he marched out to the Overseas Training Brigade. On 3rd July 1918 Gunner Collyer departed Southampton for return to Le Havre, France. Gunner Collyer rejoined his unit on 14th July 1918, when the 4th Division Ammunition Column was at Frenchencourt, France. On 9th March 1919 Gunner Collyer left his unit, and marched into the Base Depot at Le Harve to commence his return to Australia. He departed France on 31st March 1919. He arrived at Weymouth, England, on 1st April 1919, where he marched into the No. 4 Command Depot. On 12th May 1919 Gunner Collyer departed England for return to Australia aboard the HT Port Napier (along with Wongarbon Coo-ee Driver Saunders). Gunner Collyer arrived in Sydney on 5th July 1919, and was discharged on the 19th of August 1919. NSW Birth Registration 35916/1896 William A Collyer. Per his military service record (Depot), Jacob Isak Palmgren was born at Stockholm, Sweden. He stated he was a naturalised British subject. He gave his age as 33 years and 10 months, his marital status as single, and his occupation as engine driver. His description on his certificate of medical examination was height 5 feet 6 ½ inches tall, weight 154 lbs., with a dark complexion, blue eyes, and brown hair. His religious denomination was Lutherian. He listed his next of kin as friend, Mr. W. Richard, Wongarbon, N.S.W. “J. T. Palmyren” was reported in The Dubbo Liberal and Macquarie Advocate on 29th October 1915 as being one of the ‘Wongarbon boys’ with the Coo-ees. It appears he was one of the thirteen men who stepped forward and gave his name, ‘either to march under Captain Nicholas, or to come after harvest’, when the Coo-ees recruited in Wongarbon on 14th October 1915. He completed his medical examination on the 16th October 1915 at Wellington (while the Coo-ees were staying in this town). He was attested by Captain Nicholas while the Coo-ees were at Stuart Town on the 19th October 1915. He claimed that he had no previous military service. After completing the remainder of the Coo-ee March he went to Liverpool Camp as reinforcement for the 13th Battalion. On 7th December 1915 he was charged with being absent without leave from the 3rd to the 7th of December 1915. He was fined 1 Pound. The Wellington Times reported on 13th January 1916 that the ‘Wongarbon folk’ gave a farewell on New Year’s Eve to ‘the local lads who had joined the Coo-ees’, and were back in Wongarbon on final leave, and that the ‘guests of the evening were Sergeants T. Dowd and H. Davenport, and Privates W. McDonald, E. May, and J. Palmgren’. They were each presented with a wristlet watch. Private Palmgren was charged with being absent without leave from the 1st to the 3rd February 1916, being absent from special all night piquet on 5th February 1916, and being absent without leave from the 10th to the 13th February 1916. He was fined another pound. On 15th February 1916 Private Palmgren went before a Medical Board at Liverpool Camp due to bad haemorrhoids. On 22nd February 1916 Private Palmgren was discharged medically unfit. 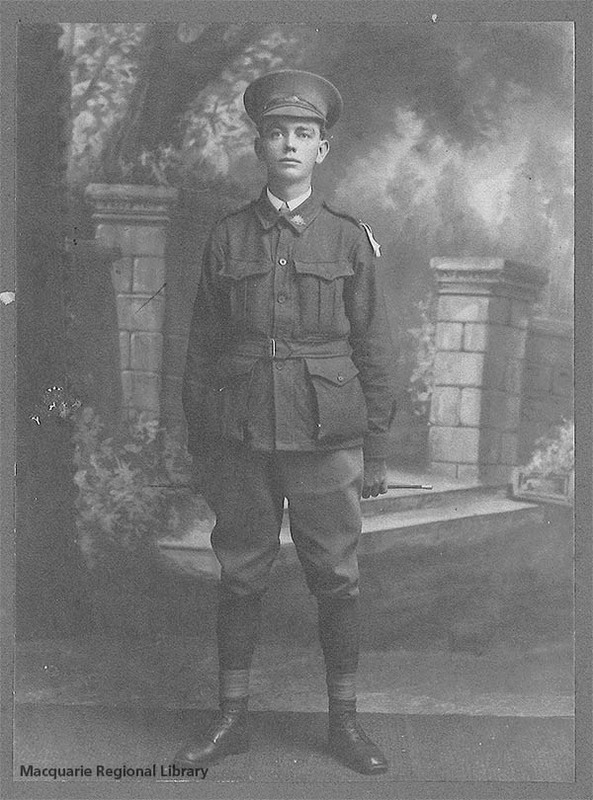 On 30th December 1916 Jacob Isak Palmgren re-enlisted at Dubbo. He completed his medical examination, and was attested, at Dubbo on 30th December 1916. He was at Sydney Showground Camp in 3rd Depot Battalion from 2nd January to the 4th January 1917, then was placed in the 9th reinforcements for the 45th Battalion on 4th January 1917. On his embarkation roll his address at time of enrolment was Wongarbon, N.S.W. His next of kin was listed as his friend, William Richard, Wongarbon, Western Line, N.S.W. His religion was recorded on this document as Unitarian. Private Palmgren (regimental no. 3432) departed Sydney on the HMAT Anchises A68 just over three weeks from re-enlisting, on 24th January 1917. He arrived at Devonport in England on 27th March 1917. He marched into the 12th Training Battalion at Codford the same day. Two days later, on 29th March 1917 Private Palmgren was admitted to the 1st Australian Dermatological Hospital at Bulford sick. He was transferred to Parkhouse on 23rd April 1917. He was discharged from hospital on 9th May 1917. On 2nd November 1917 Private Palmgren departed Southampton, England, for France, as reinforcement for the 45th Battalion. He arrived in Havre, France, the next day, and marched in to the Australian Infantry Base Depot. On 8th November 1917 he marched out to join the 36th Battalion. On 17th November 1917 he was taken on strength of the 36th Battalion from the 9th reinforcements for the 45th Battalion, when the 36th Battalion was resting at Vieux-Berquin, France. On12th February 1918 Private Palmgren was admitted to hospital sick. He rejoined the 36th Battalion on 14th February 1918. On 30th April 1918 Private Palmgren was transferred to the 34th Battalion while it was at Franvillers. He also was admitted to the Casualty Clearing Station sick with Influenza on the same day. On 2nd May 1918 he was admitted to the 3rd Stationary Hospital at Rouen with Influenza. He was transferred to No. 2 Convalescent Depot at Rouen on 6th May 1918. He was moved to the No. 1 Convalescent Depot at Rouelles the next day. He was discharged to the Australian Infantry Base Depot on Havre on 17th May 1918. On 12th June 1918 he marched back out to the Front , and rejoined his unit on 18th June 1918. On 11th July 1918 Private Palmgren was charged with being absent without leave from 9.30 pm on 6th July 1918 to 9.30 pm on 8th July 1918. He was awarded 14 days Field Punishment No. 2 and forfeiture of 17 days days pay. On 20th July 1918 he was admitted to the 5rh Casualty Clearing Station sick with Pyrexia. He rejoined his unit on 29th July 1918. On 23rd August 1918 Private Palmgren was slightly wounded in action when the 34th Battalion was in the line near Vaire-sous-Corbie, France. He remained on duty with the Battalion. On 31st August 1918 he was wounded a second time when the 34th Battalion was attacking along the Somme River between Bray and Curlu, France. He was admitted to the 53rd Casualty Clearing Station. The next day we was evacuated, and admitted to the 2nd General Hospital in Havre on 1st September 1918, with a gunshot wound to his nose. On 7th September 1918 he was transferred to No. 1 Australian Convalescent Depot at Havre. On 12th September 1918 Private Palmgren was discharged to the Australian Infantry Base Depot, where he was charged with when being on active service (1) drunkenness, and (2) absent from 9.30 pm to 9.45 pm on 9th September 1918. He was awarded forfeiture of 14 days pay. He was admitted to the 39th General Hospital in Havre two days later, on 14th September 1918. He remained in hospital until 5th November 1918, when he was discharge to the Australian Infantry Base Depot at Havre. On 16th November 1918 Private Palmgren was charged with being absent with drunkenness and being absent without leave from 0930 to 2130 on 8th November 1918. He was also charged with being in town without a pass. He was awarded 14 days field punishment no. 2, and forfeited 15 days pay. Private Palmgren marched out to rejoin his unit on 2nd December 1918. On 18th January 1919 Private Palmgren was chargd with being absent without leave from 0900 to 1930 on 5th January 1919, and drunkenness. He was awarded 7 days field punishment no. 2, and forfeited 9 days pay. Private Palmgren departed France on 21st April 1919, and marched in to Codford, England on 22nd April 1919. He was granted leave from 20th June 1919 to report to Sutton Veny on 31st July 1919. His leave was extended to 22nd August 1919. Private Palmgren commenced his return to Australia from England aboard the H.T. Euripides on 8th September 1919. He disembarked in Sydney on 24th October 1919. He was discharged termination period of enlistment on 1st December 1919. Per his military service record (regimental no. 6836), Henry Neirhoff was born at Sydney, N.S.W. He gave his age as 24 years and 1 month, his marital status as single, and his occupation as labourer. His description on his Certificate of medical examination was height 5 feet 3 inches tall, weight 133 lbs, with a fair complexion, blue eyes, and auburn hair. His religious denomination was Church of England. ‘H. Nierhoff’[sic] was named as being one of the ‘Wongarbon boys’ with the Coo-ees in the Dubbo Liberal and Macquarie Advocate. He may have been one of the thirteen men who stepped forward and gave his name, ‘either to march under Captain Nicholas, or to come after harvest’, when the Coo-ees recruited in Wongarbon on 14th October 1915. An initial Application to Enlist in the Australian Imperial Force form in his file was addressed to the Recruiting Officer at Wellington, and gave his postal address as Wongarbon, and was dated 17th October 1915 (the date the Coo-ees left Wellington). ‘H. Neirhoff’ was named as one of six men who joined the Coo-ees ‘on the road from Wellington’ in the Molong Express and Western District Advertiser. Henry Neirhoff completed his medical examination at Molong on 22nd October 1915, and was attested by Captain Nicholas at ‘Molong (8 miles east)’, along with several other Coo-ees, on 22nd October 1915. He claimed to have no previous military experience. After completing the Coo-ee March he went to Liverpool Camp as a reinforcement for the 13th Battalion. On Monday 3rd January 1916 Private Neirhoff was presented with a wristlet watch by the people of Wongarbon as a send-off present at the Wongarbon Railway Station platform. On Private Neirhoff’s embarkation roll his address at time of enrolment was Wongarbon, N.S.W., and his next of kin is listed as his brother, R. [Rudolph] Neirhoff, Penshurst, N.S.W. Private Neirhoff departed Sydney on the SS Port Nicholson on 8th November 1916 with the 22nd reinforcements for the 13th Battalion. He arrived at Devonport, England on 10th January 1917, and marched into the 4th Training Battalion at Codford, England. On 16th February 1917 Private Neirhoff was charged with overstaying his leave from midnight 2nd February 1917 till noon 12th February 1917. He was sentenced to 10 days detention and fined 23 days pay. On 27th February 1917 Private Neirhoff was sent to Bulford Hospital with Scabies. He was discharged on 6th March 1917. On 22nd May 1917 Private Neirhoff departed from Southampton, England, bound for France. He was taken on strength of the 13th Battalion on 10th June 1917, when it was in the front line in the vicinity of Messines, Belgium. On 20th December 1917 a Field General Court Martial was held where Private Neirhoff was charged with desertion whilst on active service from Belgian Chateau camp on 23rd September 1917, to 7th November 1917. He pleaded not guilty, and was found not guilty of desertion, but guilty of being absent without leave. He was sentenced to 2 years hard labour. On 3rd January 1918 Private Neirhoff was admitted to No. 4 Military Prison at Rouen, France, to commence his sentence. On 31st October 1918 Private Neirhoff was sent to the 10th General Hospital at Rouen, France, suffering Piles. He was sent back to prison on 9th November 1918. On 4th February 1919 Private Neirhoff was released from prison with the unserved portion of his sentence suspended. He rejoined the 13th Battalion on 12th February 1919. On 4th March 1919 Private Neirhoff was detached for duty at the Corps workshop at Jeumont, France. On 26th April 1919 he was sent to the Base Depot at Le Harve. He departed France on 13th May 1919, and arrived in Southampton, England, on 14th of May 1919. On 23rd July 1919 Private Neirhoff departed England aboard the H.M.A.T. Main, bound for Australia. He arrived in Sydney on 15th October 1919, and was discharged Termination of Period of Enlistment on 7th November 1919. Per his Attestation paper on military service record (Lieutenant), Harry Davenport, with a note ‘true name Harry Swendson’, was born at Toronto, Canada. He gave his age as 41 years, his marital status as widower, and his occupation as Billiard Table Proprietor. His description on his medical was height 5 feet 10 5/8 inches tall, weight 168 lbs., with a fair complexion, grey eyes, and brown hair. His religious denomination was written as ‘none’. He claimed that he had no previous military service. He stated that he was a member of the Wongarbon Rifle Club. The Dubbo Liberal and Macquarie Advocate reported on 29th October 1915 (p. 4) that ‘H. Davenport’ was one of the Wongarbon boys who had joined the Coo-ees. According to an article in The Farmer and Settler on 19th October 1915 (p. 3), thirteen men stepped forward and gave their name, ‘either to march under Captain Nicholas, or to come after harvest’, when the Coo-ees recruited in Wongarbon on 14th October 1915. It appears Harry Davenport was one of these men, but he needed time to get his affairs in order, as he did not join the Coo-ees until the 24th October 1915 at Orange, where he undertook his medical examination, and was attested by Captain T. A. Nicholas. A note on the top of his Attestation paper in his service record said he ‘presented at Orange 24/10/15’. His original Application to enlist in the Australian Imperial Force form, addressed to the Recruiting Officer at Orange, gave his postal address as ‘Wongarbon’. After completing the march he went to Liverpool Camp as reinforcement for the 13th Battalion. During this time he was reported in The Farmer and Settler on 5th January 1916 (p. 3) as being a platoon sergeant in E Company, which consisted of many of the Coo-ees. On his Application for a commission in the Australian Imperial Forces form dated 10th July 1916 in his service record he stated previous military experience of 7 years with the Vancouver Rifle Club in Canada, and being with the Wongarbon Rifle Club since July 1914. For education qualifications he stated he attended Central High School Toronto, Ont., Canada, and Wentworth Military Academy in Missouri U.S.A. Also recorded is “Sergt. “C” Coy 13th Battalion Kiama”. He gave his date of birth on this form as 31st March 1874, and his age as 42 years and 3 months. He gave his next of kin as daughter, Vieve Gwen Davenport, 324 Michigan Ave., Chicago, U.S.A. His religion is noted as Church of England on this form. Private Davenport was sent to the A.I.F. Officers Training School at Duntroon where he trained to be an officer. On the 25th July 1916 he was appointed a Second Lieutenant. On his embarkation roll his address at time of enrolment was 493 Dowling Street, Moore Park, Sydney, N.S.W., and his next of kin is listed as a friend, Miss F. Pole-Hore, 493 Dowling Street, Moore Park, Sydney, N.S.W. On the 8th November 1916 Second Lieutenant Davenport departed Sydney as part of the 22nd reinforcement for the 4th Infantry Battalion aboard the SS Port Nicholson. He arrived at Devonport in England on 10th January 1917. He marched into the 1st Training Battalion at Durrington the same day. On the 18th June 1917 Second Lieutenant Davenport departed England for France, arriving at the 1st Division Base Depot at Le Harve on 20th June 1917. On 11th July 1917 Second Lieutenant Davenport left Le Harve to join the 4th Battalion. He marched in on 15th July 1917 whilst the Battalion was conducting training in the Bray Sur Somme area of France. On the 16th July 1917 he was promoted to Lieutenant. Less than three months after his arrival in France, on 4th October 1917 Lieutenant Davenport was wounded in action, being shot in the chest, while the 4th Battalion was engaged in an attack at Broodseinde Ridge, Belgium. He was evacuated to an Aid Post, but died of his wounds prior to arrival. He was buried on Broodenside Ridge, however his grave marker was destroyed in further fighting. 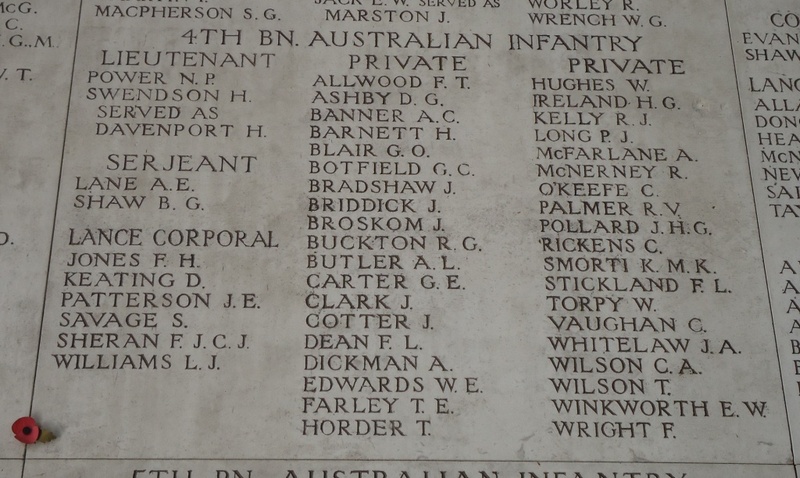 Lieutenant Davenport has no known grave, and is remembered on the Menin Gate Memorial at Ieper (Ypres), Belgium. His name is also listed on the Wongarbon Soldiers Memorial, and the Atchison County WWI Memorial Honor Roll at Atchison, Kansas. Harry Davenport appears to have had a few mysteries in his past. It is not known exactly when he arrived in Australia, but he is reported in an article in The Dubbo Liberal and Macquarie Advocate on 12th February 1915 (p. 2) as having purchased a billiard room, fruit and tobacconist’s shop in Wongarbon. According to correspondence from Harry Augustus Swendson’s family in Harry Davenport’s service record, his family had no knowledge of Harry Davenport marrying, or having a daughter. 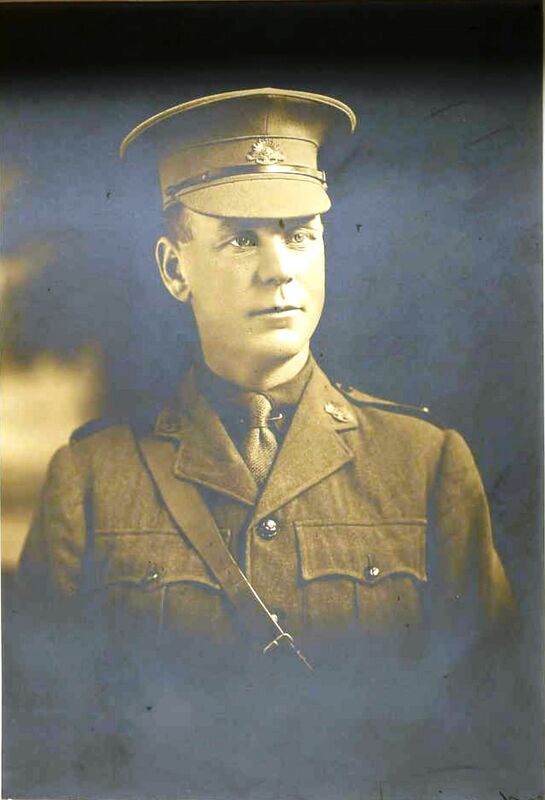 His family had received letters (addressed from H. Davenport) and a photograph from him in his AIF uniform while he was overseas on active service before he was killed. According to an article titled ‘Lt. Harry Swendson’ on the Shawnee County Casualties in WWI web page http://www.shawneeww1.info/stories/storiesSwendson.html, his actual date of birth was 31st March 1880, not 31st March 1874 as he claimed in his AIF service record, which would have made him only 35 years of age when he joined the Coo-ee March, not 41 years as he claimed. He was also actually born at Hawthorn, Atchison County, Kansas, not Toronto, Canada, as he had claimed on his application papers. He is noted on the Commonwealth War Graves Commission site as being the son of S. and Sarah A. Swendson, a native of Hawthorn, Kansas, U.S.A., and being aged 35 years when he died. Per his military service record (regimental no. 6244), Thomas Walter Dowd was born at Wellington, N.S.W. He gave his age as 31 years and 11 months, his marital status as single, and his occupation as farmer. His description on his medical was height 5 feet 8 3/8 inches tall, weight 150 lbs., with a fair complexion, blue eyes, and brown hair. His religious denomination was Roman Catholic. He claimed that he had no previous military service. He was one of the thirteen men who stepped forward and gave his name, ‘either to march under Captain Nicholas, or to come after harvest’, when the Coo-ees recruited in Wongarbon on 14th October 1915. It is not clear where he joined the Coo-ee March, but written on the top of the first page in his service record is that he ‘Presented at Orange 24/10/15’. He completed his medical on the 24th October 1915 at Orange, and was attested at Orange on 24th October 1915. There is a docket in the official correspondence of the march dated 24th November 1915, for “T. Dowd, barbering for Coo-ees 21 days @5/- £5-0-0”. This was the profession he was to undertake later in his life after the end of the First World War. After completing the remainder of the march he went to Liverpool Camp as reinforcement for the 13th Battalion, where he was Acting Sergeant. On his embarkation roll his address at time of enrolment was Wongarbon, N.S.W., and his next of kin is listed as his father, T. Dowd, Maryvale, N.S.W. Acting Sergeant Dowd departed Sydney on the HMAT Euripides A14 on the 9th September 1916, and arrived at Plymouth, England, on the 26th October 1916. On the 4th November 1916 he marched into the 4th Training Battalion. On the 28th December 1916 Acting Sergeant Dowd departed Folkestone aboard the Princess Clementine bound for France. On the 29th December 1916 he marched into the 4th Australian Division Base Depot at Etaples where he reverted to the rank of Private. On the 5th February 1917 Private Dowd was taken on strength of the 19th Battalion. On the 27th April 1917 he was promoted to Lance Corporal. On the 20th May 1917 Lance Corporal Dowd was detached for duty with the 20th Battalion, then on the 16th June 1917 he was detached for duty with the 5th Australian Machine Gun Company. On the 24th October 1917 Lance Corporal Dowd attended the 6th Officer Cadet Training Battalion at Oxford. A Confidential Report in his service record dated 27th March 1918 (while he still had the rank of Lance Corporal) had the following remarks: “A very fine character, with any amount of common-sense, grit and determination, also a certain amount of originality. Will lead men anywhere, and win affection and confidence”. He qualified for a commission on the 30th April 1918. He then attended a Machine Gun course. On the 1st June 1918 he was appointed a Second Lieutenant and on the 31st July 1918 was taken on strength of the 2nd Australian Machine Gun Battalion. On the 3rd September 1918 Second Lieutenant Dowd was wounded in action, and admitted to the 5th Field Ambulance suffering shrapnel wounds to the face and hand. He was moved back to the 53rd Casualty Clearing Station, then to the 20th General Hospital, where he remained until the 20th September 1918. On the 2nd January 1919 Lieutenant Dowd went to the United Kingdom on leave. He returned to his unit on the 18th January 1919. Lieutenant Dowd departed England on the 19th April 1919 aboard the H.T. Sardinia for return to Australia. He arrived at Sydney on the 8th June 1919. He was discharged on the 21st July 1919. Per his military service record (regimental no. 4901), William Hilton Saunders was born at Goodooga, N.S.W. He gave his age as 21 years and 2 months, his marital status as single, and his occupation as Grocer. His description on his medical was height 5 feet 7 ½ inches tall, weight 9 stone 10 lbs., with a fair complexion, greenish grey eyes, and fair hair. His religious denomination was Anglican. He completed his medical on the 8th October 1915 at Gilgandra before the march began. He was attested at Stuart Town on the 19th October 1915. He claimed that he had no previous military service. He was one of the thirteen men who stepped forward and gave his name, ‘either to march under Captain Nicholas, or to come after harvest’, when the Coo-ees recruited in Wongarbon on 14th October 1915. On his embarkation roll his address at time of enrolment was Wongarbon, N.S.W., and his next of kin is listed as his father, E. J. Saunders, Wongarbon, N.S.W. 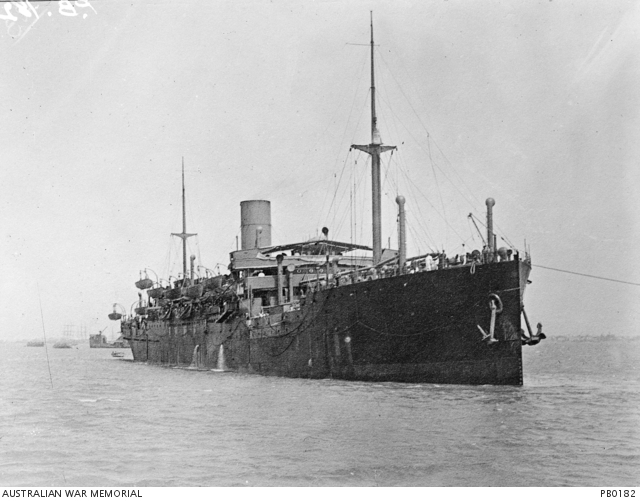 Private Saunders departed Sydney on the HMAT Star of England on the 8th of March 1916. He arrived in Egypt on the 11th of April 1916. On the 16th of April 1916 he transferred to the 4th Division Artillery at Telelkebir, and was taken on strength of the 10th Field Artillery Brigade. He was appointed Driver on 18th May 1916. On the 23rd of May 1916 he was taken on strength of the 4th Division Ammunition Column. On the 6th June 1916 Driver Saunders left Alexandria aboard HMT Oriana, bound for France, arriving at Marseille on the 13th June 1916. On the 17th August 1917 Driver Saunders was charged with, when on active service, being drunk in Calais about 9.15 pm. He was awarded 21 days Field Punishment Number Two. On the 15th October 1917 Driver Saunders was wounded in action suffering a gunshot wound to his right foot. He was evacuated to the 3rd Field Ambulance. On the 16th October 1917 he was sent to the 35th General Hospital, and on the 19th October 1917 he boarded a ship for England. On 20th October 1917 he was admitted to the East Suffolk Hospital. Driver Saunders was granted leave from Hospital on the 20th November 1917. On the 9th January 1918 Driver Saunders departed Southampton to return to France. He rejoined his unit on the 15th January 1918. On the 2nd September 1918 Driver Saunders was admitted to the 13th Field Ambulance sick. On the 5th September 1918 he was transferred to the 41st Stationary Hospital. On the 6th September 1918 he was sent to the 9th General Hospital at Rouen. On the 12th September 1918 he went to the 11th Convalescent Depot. Driver Saunders rejoined his unit on the 28th September 1918. On the 26th October 1918 Driver Saunders went on leave to the United Kingdom. On the 18th November 1918 Driver Saunders was charged with being Absent Without Leave from 6.00 am on the 12th November 1918 to 10.10 pm on the 16th November 1918. Per his 1918 war diary, this period of absence was while he was celebrating the Armistice in London. His entry for the 16th November 1918 was: “Had a great day … Here I am pinched by the MPs & in Warwick Square quite forgot that my pass is overdue & I should have gone back. Oh yes days ago. Who cares”. He was awarded forfeiture 5 days pay on 18th November 1918, which was increased to a total forfeiture of 10 days pay on 2nd January 1919. On the 12th May 1919 Driver Saunders departed England for return to Australia aboard the HT Port Napier. He arrived in Sydney on the 5th July 1919, and was discharged on the 19th August 1919. Saunders, William Hilton, personal diary, 1918.